Thanks for spreading my photo! you had me at "trick"
you're in luck! I was assigned a etoudffe video to do for About.com. You should see it soon. 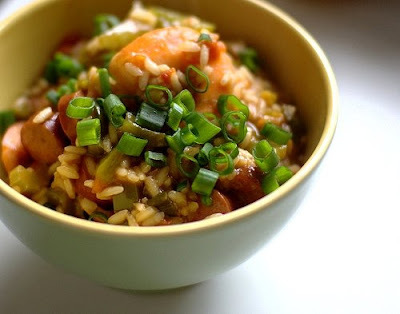 Has anyone ever made brown jambalaya? The place near me makes it brown, no red in it at all. I guess they leave out the tomatoes and paprika. They serve it with a delicious rich thick tomato sauce around it. Anyone have a recipe? I saw the recipe and it says to brown the onions well. I guess that is the step which carries the dish. I sometimes brown onions and puree them (with roasted garlic) and add it to pan sauces to give it extra flavor and color.